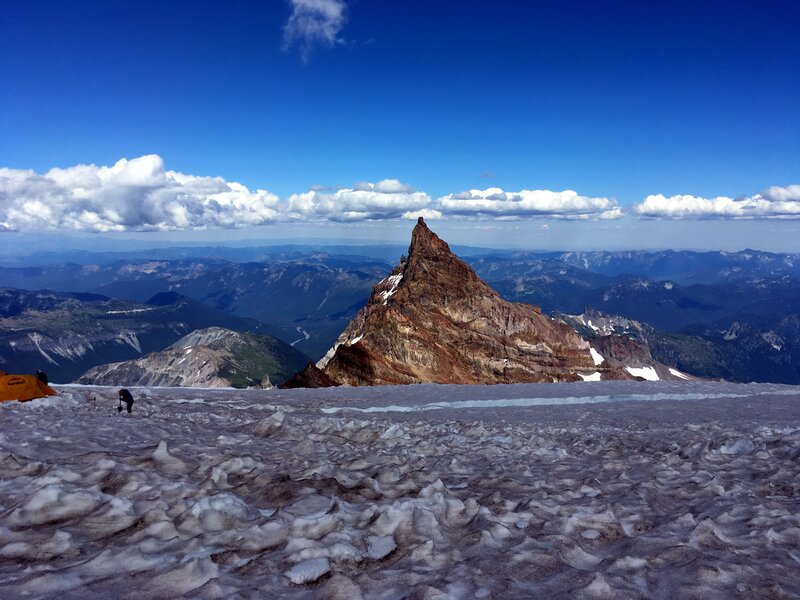 Ingraham Flats has a beautiful view of Little Tahoma Peak (the third highest point in WA state) and of the far East slopes of the south central cascades – and it shortens the summit day by 1000′ compared with Camp Muir! We melted enough water for the following day, ate dinner by 5pm, set up the glacier rope for the following morning, and by 6pm were in bed, asleep for the very early morning wakeup ahead. 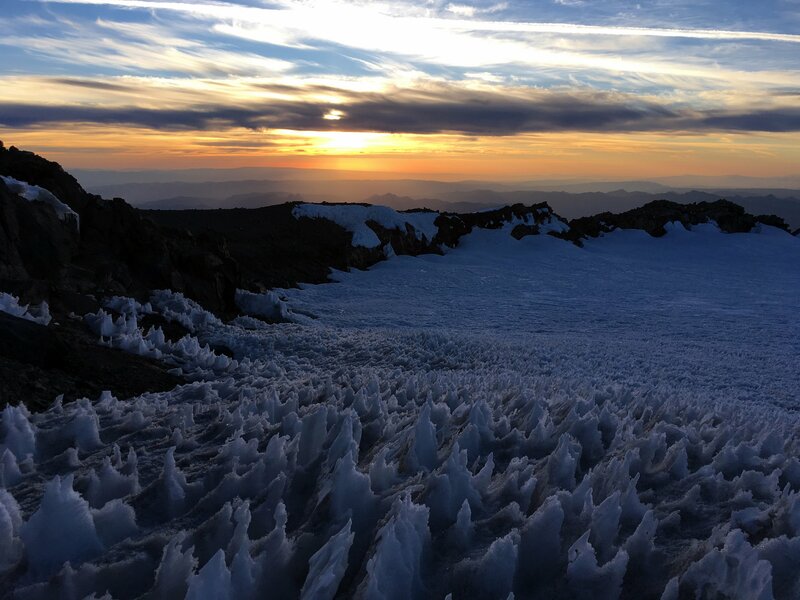 The freezing level was very high, and to reduce the risk of rock and ice fall we wanted to travel in the coolest hours of the evening on our ascent. We were up again at 11:30pm and moving by about 12:15am after getting some surprisingly effective rest. We saw two points of light high on the cleaver but otherwise we were the first team up on the route – ahead of the multiple guided parties on the mountain this day. My biggest hesitation about the mountain wasn’t any worry about our own skills or fitness, which were more than up to the task of the DC. 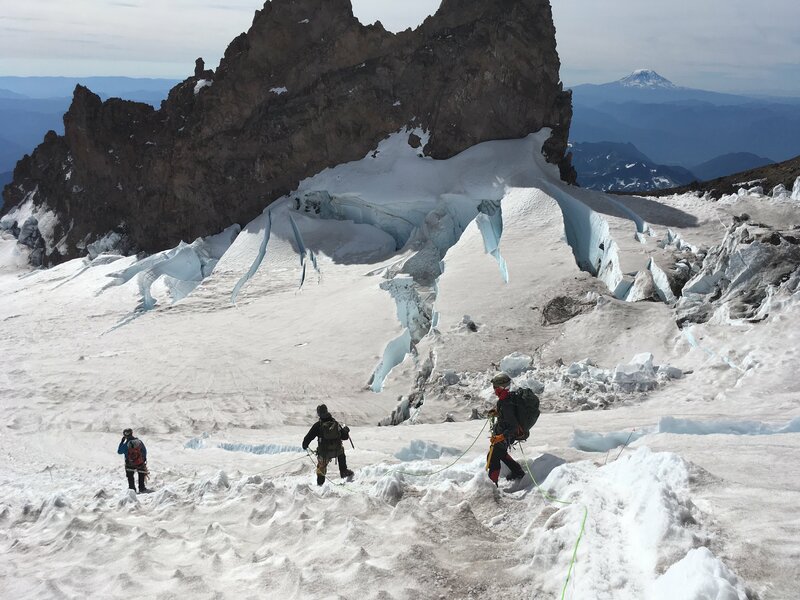 In the late season, I was most concerned about the “random” events on the mountain – rockfall, icefall – that we can’t do anything about other than minimize our exposure. 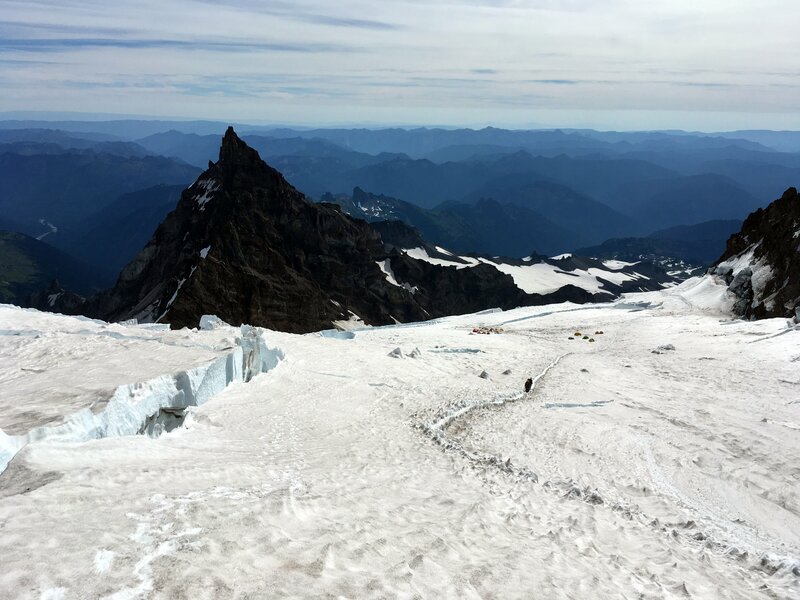 The most dangerous section of the route is just above Ingraham Flats, in the area where 11 climbers were killed in a massive icefall back in 1981. We did not stop moving through this section until we were at the top of the cleaver. The cleaver itself consists of crumbly volcanic rock and loose dirt at a very steep pitch. Switchbacks on the lower portion of the cleaver are easy to follow, but on the upper section we found wands left by the guide services but heading in two separate paths – one out onto a snow slope, the other going high onto the spine of the cleaver. We elected to take the high route but it was a mistake. We unfortunately knocked a couple of small rocks loose despite our best efforts, and ended up in some loose and very steep exposed spots that we did not want to descend on the way down. After around 2 hours of climbing we were at the top of the cleaver on snow, in a relatively flat section known as “High Break”. From here, the route switches back steeply back and forth on the upper Emmons glacier, end running one low crevasse far to the north before returning back on a more direct route. As reported by the guides, there were two very hollow snow bridges above 13,000′ which we crossed while using a running belay on either side, but the bridge held just fine. We could all feel the altitude and were now ascending only at a rate of around 500 feet per hour, but nobody was sick and nobody was unsteady on their feet. The weather was perfect, so we knew that it was just a matter of time before we crested the summit crater rim. 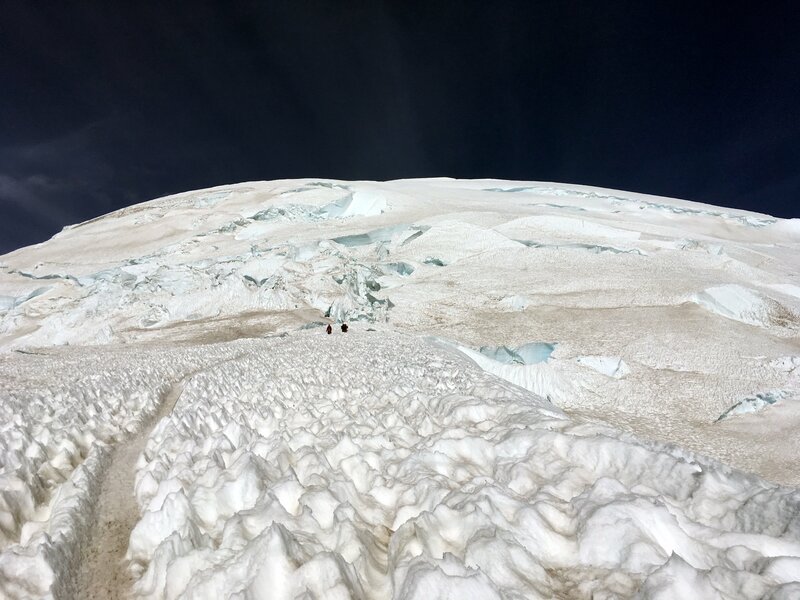 At around 13,600′, the glacier moderates in steepness and we knew we were home free. 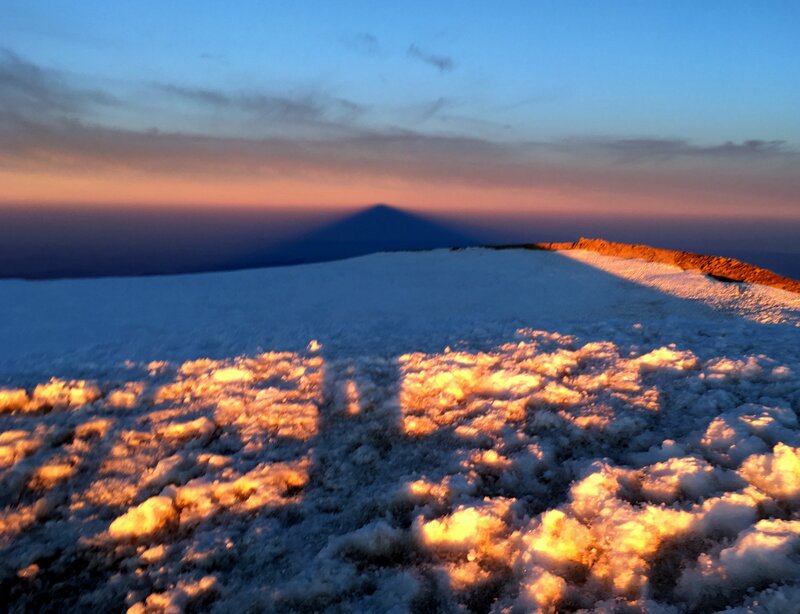 As red began to glow on the eastern horizon, before 6am, we entered the flat summit crater and crossed over to the true summit at Columbia Crest. We left our packs and rope in the crater and ascended the last hundred feet of dirt. The wind was light and warm (for the summit) – temperatures near 29F which felt quite comfortable with our puffy jackets on. 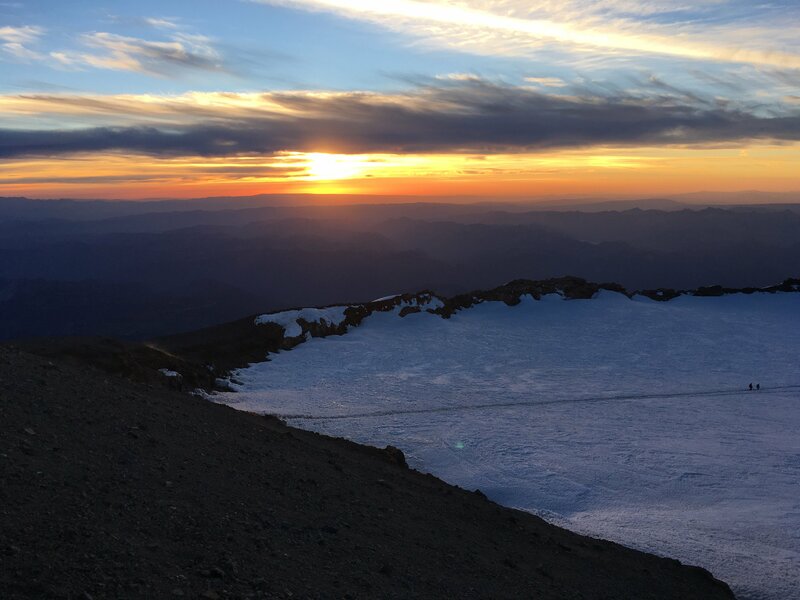 One party of three was already there, but they soon left – leaving us to ourselves on the summit just as the sun rose over central Washington. It was definitely a surprisingly emotional moment for me. 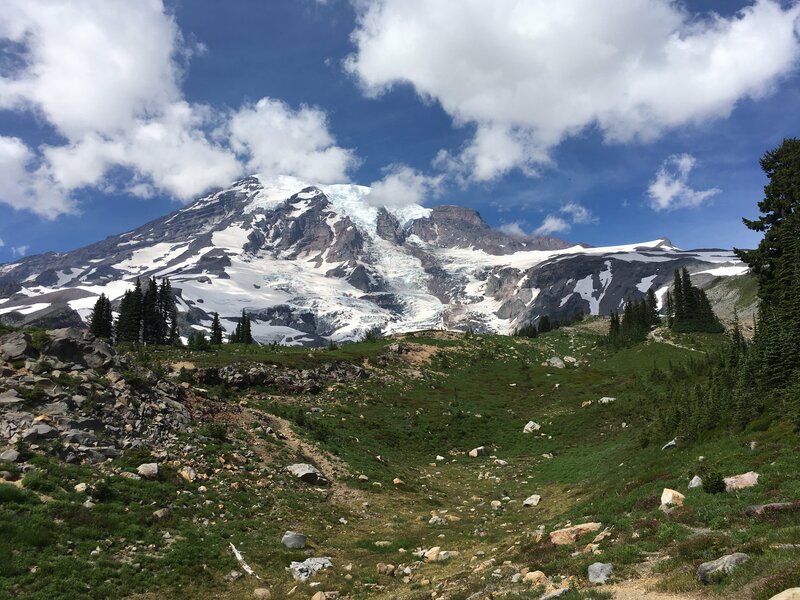 I’ve been admiring Mount Rainier from Seattle for years and enjoyed its lower slopes on skis and on foot dozens of times; finally, I was standing on top on a perfect day. We shared several minutes admiring the stratospheric views, before it was time to head back down into thicker air. 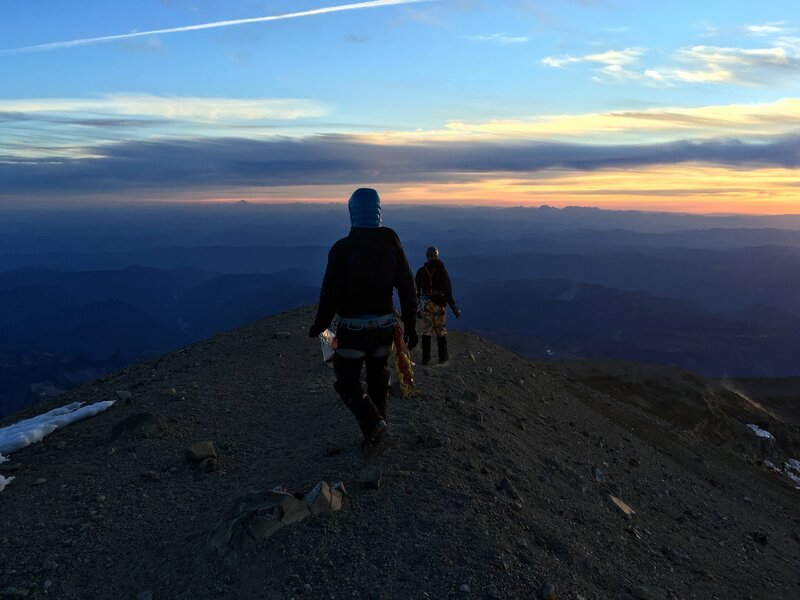 We roped back up, checked our knots, then began a deliberate descent down the switchbacks back toward the cleaver, leaving the summit crater by 6:40am. In the intervening hours, the guides had pulled the only ladder we had to cross, and we rerouted onto another thin snow bridge. 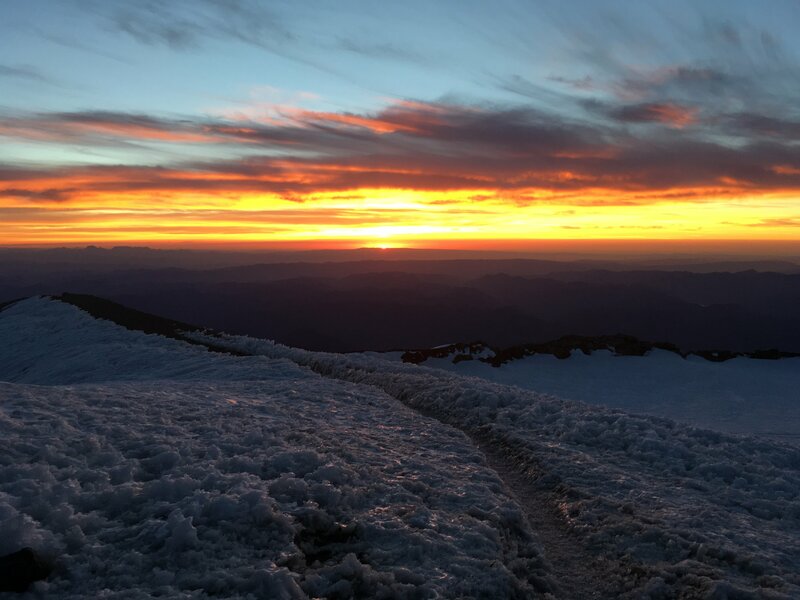 With careful crampon plants and rope management, we easily managed the upper mountain and were able to take a moment here and there to admire the huge crevasses we had passed in darkness that morning. 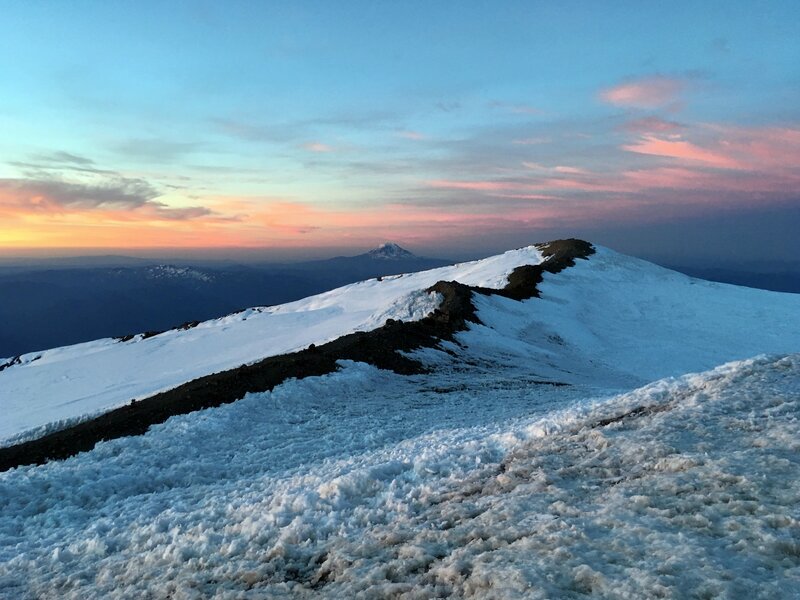 As one of our party made some adjustments to his crampon fit, we were passed by the guided parties, many of whom had done a quick ‘touch and go’ at the crater without having made it to the true summit! This is actually ideal, because they would be below us on the dangerous rockfall zone of the cleaver. After a quick break at the top of the cleaver, we moved efficiently down the snowier route on the cleaver, a much welcomed change from the loose spine route we had taken that morning. With no rock or icefall observed on the way down, we were thankfully safe and sound back at Ingraham Flats by 10am. The crevasses on the Ingraham are HUGE! 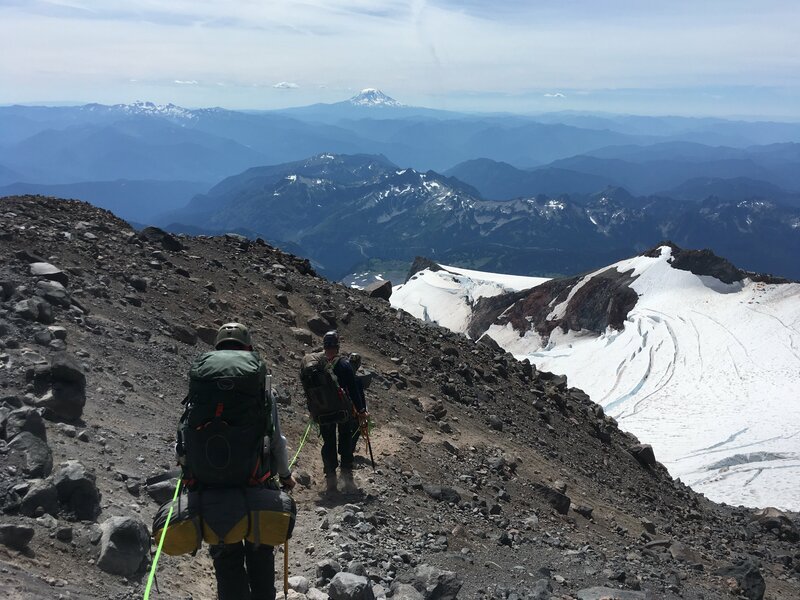 We thankfully dropped packs in camp, melted some water, and rehydrated while we admired the daytime views of Little Tahoma. 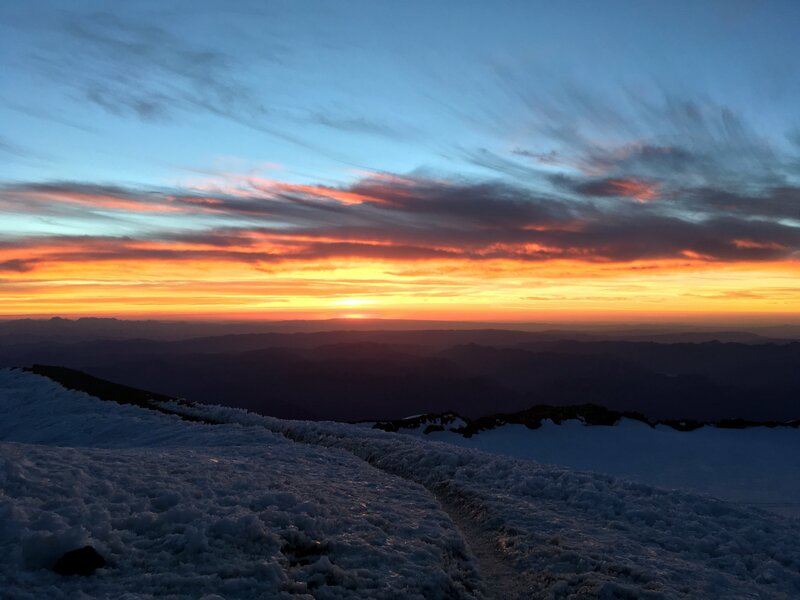 We packed up camp and were soon on our way back to Camp Muir. The descent from Muir was brutal, slip sliding on snow all the way down to Pebble Creek with heavy packs. I had forgotten that while summit day has only 3000′ of ascent, the descent is over 9000′, more than I’ve ever done with a pack for sure. By 3pm we were at the parking lot, ready to grab a burger in Ashford and get some sleep at home in Seattle. 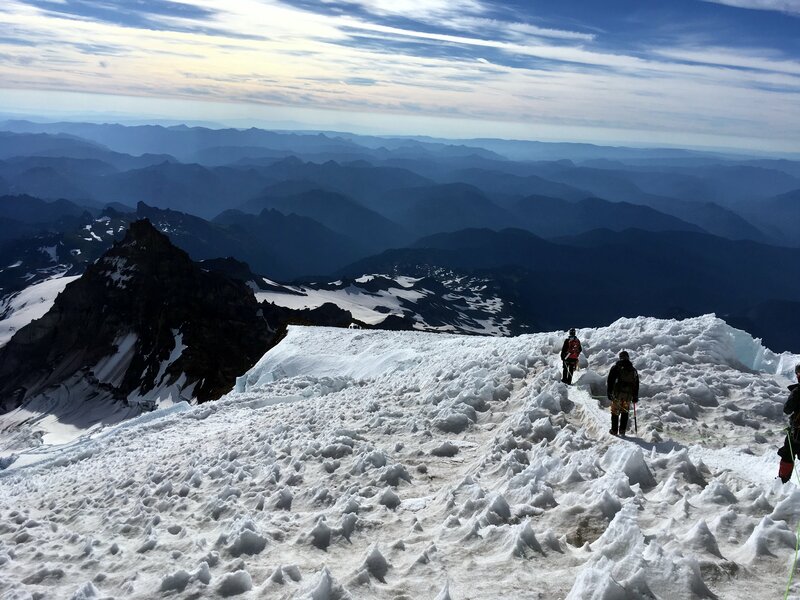 This was a perfect opportunity to bag my first ascent of Rainier with a fun crew, without dropping $1500 per person on a guide service. However, although the route is a “walk up” when in good condition like we found, so much can go wrong in a hurry on a huge glaciated peak like this. 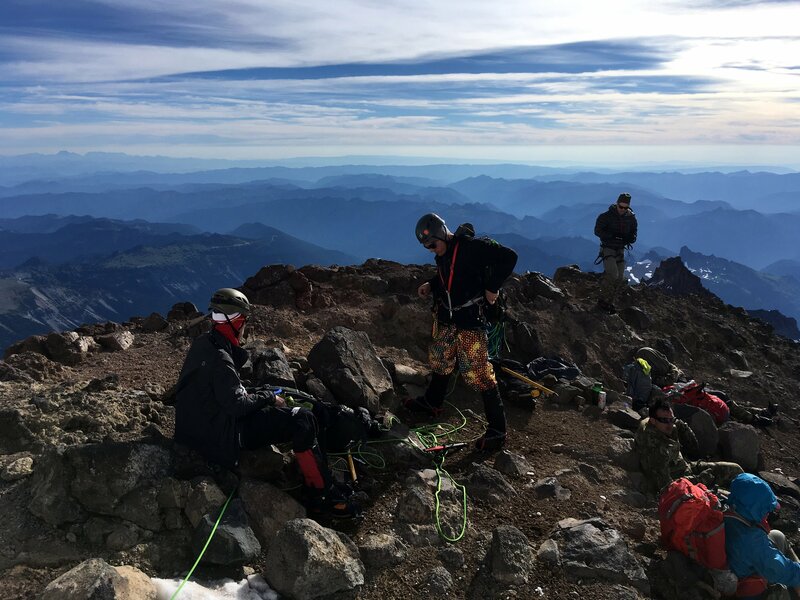 Our party had crevasse rescue experience and training through local mountaineering clubs, extensive ice axe practice and experience, and all four of us were proficient in knots and rope work. That gave us margin to climb relatively safely as an independent party. 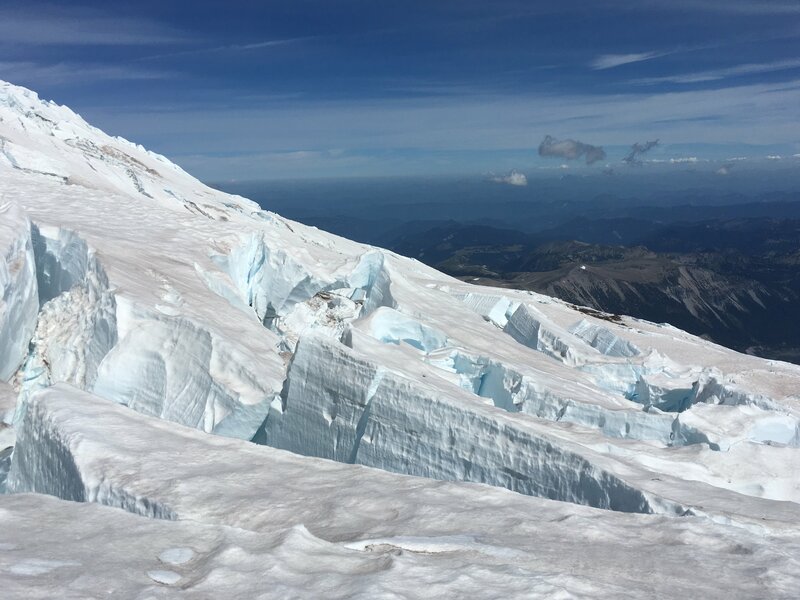 We deliberately managed the objective hazard of late-season rock and icefall with our early start, but to some extent climbing Rainier successfully always involves good luck. One climber was hit and injured by rockfall on one of the guided trips, low on the cleaver; fortunately, I believe he was able to walk out under his own power. 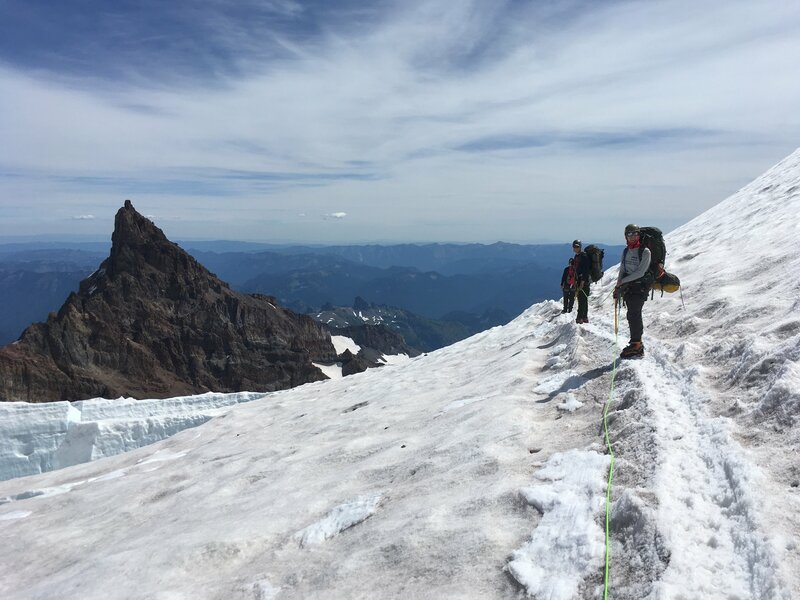 I will probably only climb the DC again in the earlier season – maybe mid-June to mid-July when I can ski the lower route and most of the mountain is still covered in snow. The rockfall makes me nervous and I didn’t find climbing the dry cleaver a fun experience.